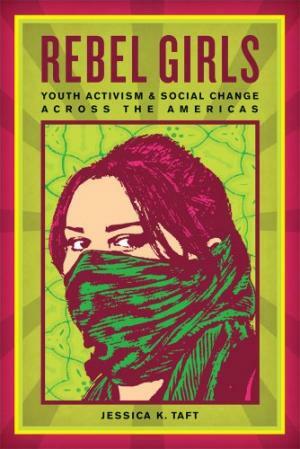 Taft’s interviews with teenage women engaged in progressive social justice work in Buenos Aires, Caracas, Mexico City, the San Francisco Bay area, and Vancouver reveals scores of young women active in sophisticated community organizing and creative political protests. These are girls shutting down their school systems to combat harassment; hosting workshops on challenging white supremacy; and railing against toxic waste facilities poisoning their communities. Rebel Girls isn’t a critique of the culture of girlhood—a blossoming field dedicated to analyzing the psychosocial experiences of teenage women as they develop. Instead, Taft investigates young women engaged in social activism (either through community organizations or through their own initiatives) – a group whose power and accomplishments have been relatively ignored by the broader social justice movement. Taft not only recognizes this, but seeks to rectify it by placing the voices of the girls front and center in her research, creating a book that is simultaneously captivating and insightful. It would be easy to stereotype the girls’ work based on their identities as teenagers or as young women. Taft astutely resists the temptation. For example, an interview with two Buenos Aires women building a community center examines how gender influences the women’s political work, but does not stray into potentially counterproductive stereotypes about girls. Observations that many of the girls featured strove to make politics “fun” does not smack of derision; rather, Taft places the girls’ “pleasurable politics” in the context of social justice movements throughout history. The fact that teenagers are largely excluded from the standard markers of political engagement—being able to vote and run for office—colors their engagement as well as their political philosophies. The girls Taft interviews have largely circumvented these political avenues in favor of more direct and in many instances, more transformative social work. While Taft notes that ignoring the macro-level influences at the root of injustice may hinder lasting social change, her reluctance to investigate this further is one of very few weak points in Rebel Girls. Through her meticulous interviews interwoven with historical background, Taft presents a work that is both a rigorous academic analysis and a thoughtful portrait of the intimate details of these women’s work.